Mouse neurons. Image via Wikimedia Commons. Originally published in PLoS Biology. 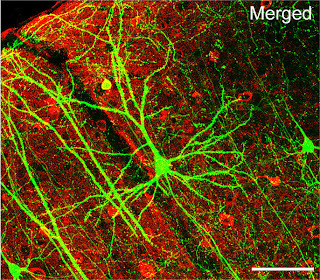 Nerve cells, called neurons, are special cells. They interact with each other and with other tissues in part by using electrical impulses. The cool thing about these cells is that thanks to their electrical signaling, we can measure when they're sending their messages. A neuroscientist friend of mine once poetically described as "exquisite" the ability to measure the firing of a single neuron in a finch brain. There is something special about being able to observe that usually hidden process of signaling that underlies every move you make, every thought you have, and every sensation you detect. The very word "neuroscience" sounds expensive. 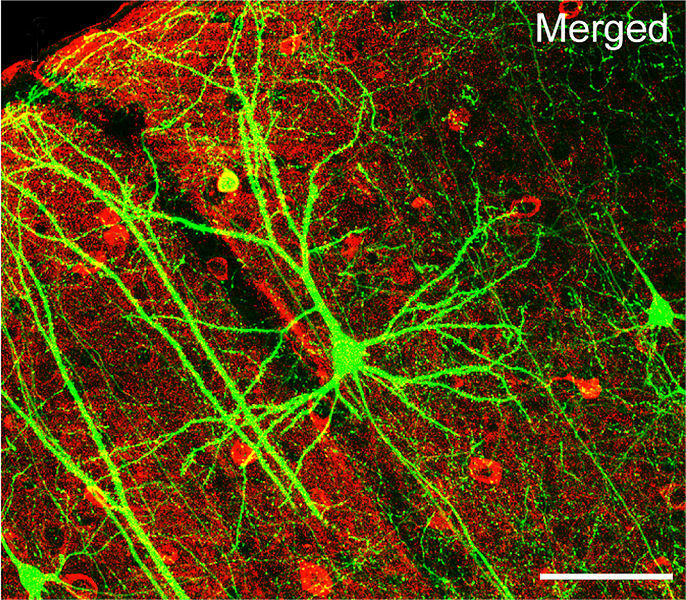 Measuring the signaling of nerves? That sounds pretty fancy. But with some wires and basic neuroscience tools, anyone can give it a try, measuring the nerve signaling, for example, in an insect. Which, do you think, would be the more memorable learning experience, a full-on sensory exposure to the sights and sounds of neuron signaling, or this? Now, a company called Backyard Brains is really bringing the neuroscience to the people. You don't have to use their affordable kits in your backyard, but as neuroscientist and writer Mo Costandi highlights today in an interview with Tim Marzullo, co-founder of Backyard Brains, this level of technology can become available to high-school students anywhere. In the interview, Marzullo notes that the goal is to produce kits that lower the fiscal and resource requirements for making neuroscience available to people who aren't graduate students in neuroscience. As part of their bringing the neuroscience to the people, the Backyard Brains scientists have created the Spiker Box kit, which lets students listen to neurons firing in a de-legged cockroach. These kits are friendly with computers, iPhones, and iPads, so students can use these devices to record and listen to the Zzzzzzztt! of a firing neuron (see video below). Electrophysiology in action, made accessible. An even fancier introduction to science awaits. Some proteins are especially made to change their shape in response to a light trigger. Scientists have produced animals--mostly fruit flies--that make these proteins in some neurons, where they don't usually occur. With light-reactive proteins present in the neurons, researchers can actually make the neurons fire by giving them a shot of laser light. In other words, they can make the animals move using light. Wouldn't it be cool if classroom students could see that kind of neuroscience in action? Backyard Brains is on the case. They're working on a product that will allow students to use blue light emitted from an iPad to trigger light-reactive proteins in nerves that communicate with muscle cells. Because the process involves light and organisms with introduced genes, it's called optogenetics. That sounds even more swanky than neuroscience, but Backyard Brains is working on making it accessible. Other Backyard Brains products include RoboRoach (you'll have to read that one for yourself), soldering kits, and the roaches themselves.